We offer affiliate programs with every e-commerce website that we do. The affilate program is included with your website without any additional cost. 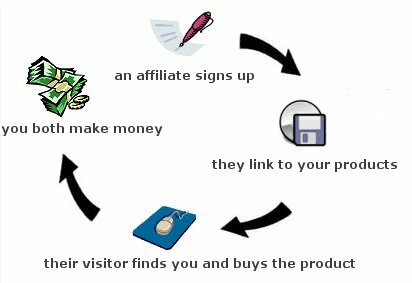 A potential affiliate partner will log on to your website. Fill out a form to become an affiliate. Upon approval, they will be set with a percentage rate and be given instructions on how to set up code on their website linking to you. This code allows us to track every sale that their link generates. These numbers are automatically calculated in their affilate administration panel. Each month you just send them a check for the percentage of sales that they earned. Most affilates are great marketers. They have an audience already coming to their website that they believe will buy your product and they'll introduce a whole new group of people to you, that may have never heard of you or your product before. Some affilates will build websites just for linking to you and selling your product. This will allow you to be making more sales without doing any extra work and paying somebody for what they're worth rather than paying them hourly or per project without knowing the return on investment. For example, if you sell sporting goods and somebody has a youth sports website that they operate. The visitors coming to that website all need to purchase sporting goods. If there's a convenient link and "recommendation" from the youth sports site then the amount of people going to you for their needs will be a lot higher than them finding you on their own when searching for the product.